Pastor David Wrightsman started serving as Augsburg’s interim associate campus pastor in August 2017. He comes to Augsburg having served in the Twin Cities for almost 30 years and in a variety of ways… outdoor ministry, urban youth worker, community partnership builder, interfaith, campus ministry, pastor and interim pastor. 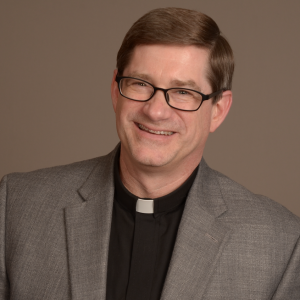 He has served previously in the parish in Minneapolis (Central); Mahtomedi (St. Andrew’s); Cottage Grove (St. Luke’s); Hopkins (Shepherd of the Hills); Hastings (St. Philip’s); Shoreview (Shepherd of the Hills) and Maplewood (Gethsemane). He lives in Stillwater along with his wife, three teenage children and their dog. His wife Lauren is also a pastor and serves at Roseville Lutheran Church in Roseville, which allows them to enjoy their roles of loving people and helping them grow in their faith and heal. Most importantly, David has single-handedly contributed to the financial success of Dunn Brothers, Starbucks and Caribou coffee shops!